If your little princess is a fan of the fairy tale and movie, throw her a Beauty and the Beast themed party. The Beauty and the Beast Beverage Napkins are perfectly sized for little hands, and little messes. 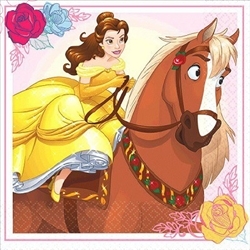 The napkins feature an image of Belle riding on the back of her beloved horse Philippe. Each package contains sixteen of these 2-ply paper napkins. Other coordinating Beauty and the Beast accessories are available too! Beauty and the Beast Favor Cup Beauty and the Beast Square Plates 9" Beauty and the Beast Luncheon Napkins Beauty and the Beast Square Plates 7"